Why did I choose to have Ryelands? Because it was reputed to be a medium sized sheep, quiet and sensible, easy on fences and a good do-er. Just the breed for a woman who herself is no longer a spring lamb. I purchased 6 ewes and a ram from the Malung Stud at Torquay, Victoria, founded in 1952. Am I happy with my Ryelands? They are quiet, sensible sheep.� They� �listen� , a bit like a dog. This could be my dog training skills coming to the fore but I think I have them well trained , however I� suspect that they think they have me well trained! When they lamb they each have an individual pen and are locked in to keep them safe from the foxes in the area. When the lambs are a little older they are allowed out to graze during the day and brought back at night. Because of the system of the gates on the pens, some ewes must come in before others. I go into the yard and tell which one I want to go up to �go to bed� and up she walks. Even when I am down to one ewe and lamb/s left in the yard she will wait until told. They always go into their own pen � a bit like a dairy cow knowing her bail. Of course the secret is operant conditioning as they are fed when they come back in. I cannot fault the temperament on my Ryelands � so yes I am happy. Do they do well on poor pasture � yes They have held their condition very well even during the long drought. I had the only fat sheep in the area! Are they easy on fences?� I haven�t had any go under, over or through. The one mistake I made was thinking that these would be �medium sized� and therefore easy for me to handle. Infact they are very heavy and it can be a bit like trying to throw a wombat. Traditionally the Ryeland has a fairly short, thick neck that makes it difficult to get the head around and the sheep off balance. Fortunately they are quiet and that allows me to do many things without tipping them up. As breeders, I am more than happy. Good lambers, excellent mothers and good milkers. 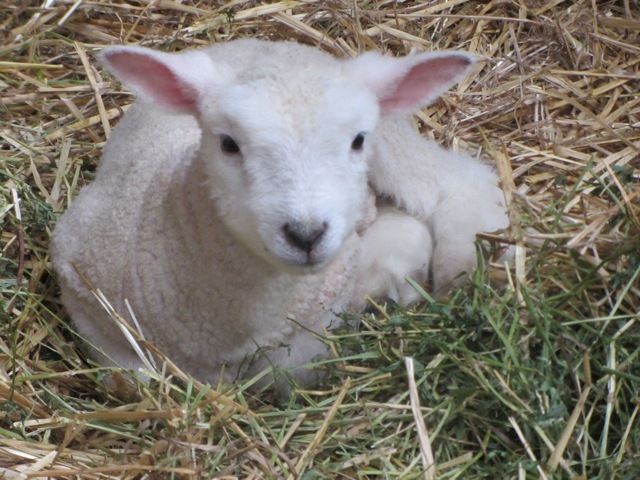 They have reared between 150-200 percent lambs in 2004,2005,2006, 2007,2008,2009, 2010,2011, 2012 with only a couple of ewes needing assistance with mispresented lambs. In 2007, after a particularly hard season, the ewes remained in very good condition. Six ewes� produced twins, 5 had singles and, surprisingly, one had triplets! Ryeland roast and chops have become very popular with my friends and I have not purchased lamb since eating Ryeland.� It has wonderful flavour and fine texture. I hope to find time to spin the wool from one of the Ryelands and knit myself a Ryeland jumper. Ryelands are an endangered breed with only 15 studs in the Flock book and one stud accounts for a major portion of the ewes joined. What a shame more people do not keep Ryelands. If you are thinking about a friendly, cute animal to keep on your lifestyle property, Ryelands may be perfect. Perhaps you are considering alpacas? Ryelands and alpacas all require shearing, foot care, vaccination and drenching. Ryelands are less costly to purchase than alpacas, not as large, and I think much more attractive.